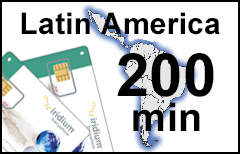 The Iridium Latin America Plan provides discounted airtime rates for customers using Iridium satellite phones in South and Central America, including Mexico, Brazil, Argentina, Colombia, Chile, Venezuela and other countries and territories (EXCEPT for the Caribbean). The account can be refilled with Latin America 200-min vouchers as often and as many times as needed with all unused minutes to be rolled over. However, the validity time will NOT be combined, the maximum validity time of available minutes cannot exceed 6 months. Do not purchase a new plan if you want to add more minutes to your existing unexpired Iridium Northern Lights account with SATTRANS. Get a new Iridium airtime voucher instead.